The prime minister of Bangladesh has said that the people of the country need to punish those who still love Pakistan despite living in an independent nation, BD News 24 reports. “The people of Bangladesh must respond to those who have been lost in their love for Pakistan. They must be punished. We must make them forget their love for Pakistan,” Sheikh Hasinas told an event on Sunday. “If we cannot do it, we will cease to exist,” she was reported as saying at the gathering, which was organised by the ruling Awami League at the Bangabandhu International Conference Centre in Dhaka. The president of the ruling party in Bangladesh was of the opinion that the assassination of founder Sheikh Mujibur Rahman in 1975 had affected the people in the country greatly. Hasina termed rival Bangladesh Nationalist Party (BNP) founder Ziaur Rehman and wife Khaleda Zia ‘lovers of Pakistan’, saying the duo had grabbed power in the country after the killing of Sheikh Mujeeb. Hasina scoffed at Zia, noting that the entire history of the country changed after 1975 as BNP made an effort to make people forget the events of 1971, which was evidence of their love for Pakistan. Hasina stated that party which came into power after the assassination of Mujeeb did not work for the people. “They did not want the country to progress. They were implementing the agenda of the Pakistani forces,” she alleged. “Pakistan would be happy if Bangladesh became a failed state and they (Bangladeshi rulers after 1975) wanted to make Pakistan happy,” she added. 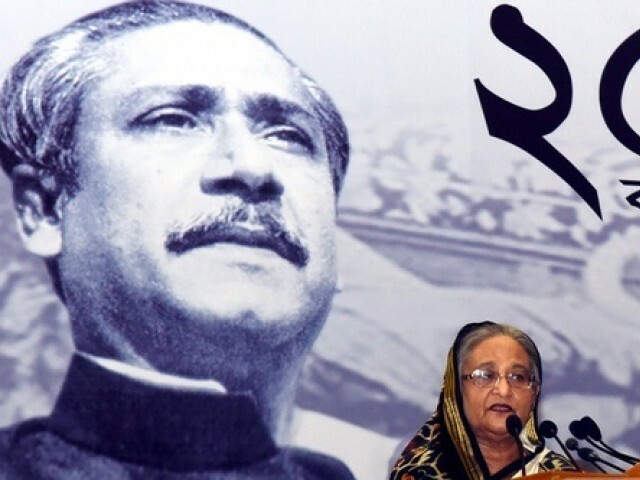 Hasina also mentioned HM Ershad, who came to power after Ziaur Rahman, in her speech. Ershad, the chief of a key ally of the Awami League, now serves as a special envoy of the prime minister. To be Honest it didn’t bothered me at all hahahahah. in Dubai i see many Bengali people they say themselves Haseena has indian influence and she need money who ever will give her money she is in her laps hahahahah. apart from that she need money for country not for herself. Bangaldesh is enjoying several privileges besides GSP awarded by European Union and US since many many years to bring her out of poverty. Had it been not awarded her neighbor would have devoured her up already. Bangaldesh will realize one day what is the meaning of sleeping with an enemy. We all have had in subcontinent a history and biter experiences. It is not the time to spread hatred which India and Bangladesh must realize in this modern world.